Heat oil in a medium saucepan over high heat. Add rice, half the cumin and chilli. Cook and stir for 1 minute. Stir in paste, stock cube and 3 cups water. Simmer, covered, for 15 minutes. Add peas. Stand, covered, for 2 minutes. Meanwhile, combine remaining cumin, paprika and oregano in a bowl. Season. Sprinkle over lamb. Spray with oil. Heat a frying pan over moderately high heat. Cook for 3 minutes each side for medium. 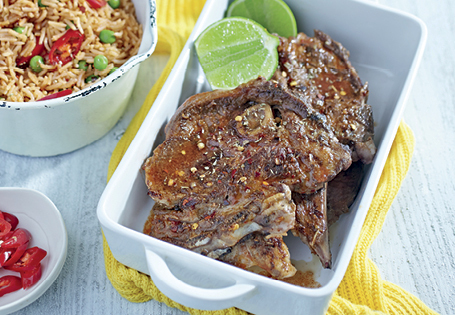 Serve lamb with rice, sliced chilli and lime cheeks.